When the Samsung 128GB Pro+ Class 10 microSDXC memory card came out in March 2016 it had wicked fast sequential speeds of 95 MB/s Read and 90 MB/s Write with an MSRP of $129.99. Over the past year the price on that card designed to be used by prosumers in action cameras, DSLRs, high-end smartphones, and Tablet PCs has fallen down to $84.00 shipped. We have a feeling that price might drop a little more as today Samsung introduced the equally impressive Samsung EVO Plus 128GB microSDXC memory card. This brand new model in the more affordable thanks to the lower $99.99 MSRP and features sequential transfer speeds of up to 100 MB/s Read and 90 MB/s Write. 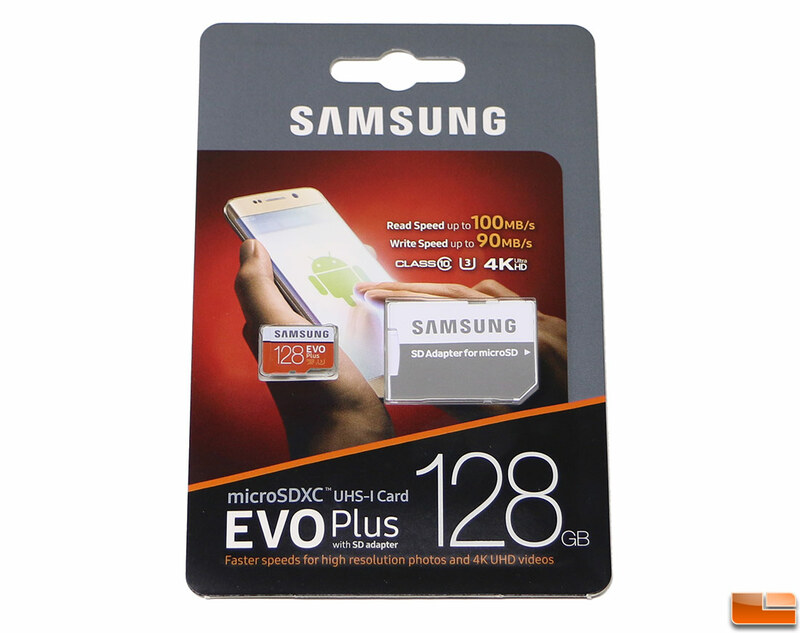 That makes the Samsung EVO Plus the fastest microSDXC solution offered by Samsung and these cards are able to reach the maximum UHS-I read speeds of 100 MB/s! Due to that fact that the Samsung Pro+ now has lower performance than the new Samsung EVO Plus, some of those cards will discontinued in the second half of 2017. Samsung has confirmed that the 128GB PRO Plus will reach end of life first in the second half of 2017 and once the remaining inventory is sold off, the Samsung Pro+ microSDXC series will be gone. All of the Samsung EVO Plus cards are backed by an impressive 10-year warranty and when it comes to pricing the MSRP for four capacities that make up the Samsung EVO Plus series are listed below. It should be noted that Samsung will be including a full-size SD card adapter with each microSD card for added value and convenience. The Samsung EVO Plus 32GB, 64GB and 128GB EVO Plus cards will be available beginning today in select countries and at select retailers. The 256GB will be available soon according to Samsung, but no exact availability date was given to us. 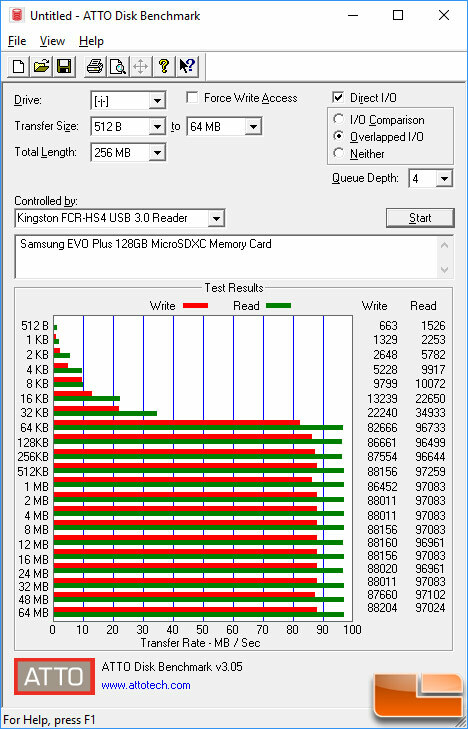 We should point out that the Samsung EVO Plus 32GB capacity card has Read/Write speeds of up to 95/20 MB/s making it better suited for HD video vs. 4K video. We got a chance to try out the Samsung EVO Plus 128GB MicroSDXC UHS-I Card and found that it was pretty fast when tested on our 7th Gen Intel Core i7-7700K powered desktop that uses an ASUS Z270 platform with a Kingston FCR-HS4 USB 3.0 memory card reader ($17.98 shipped). 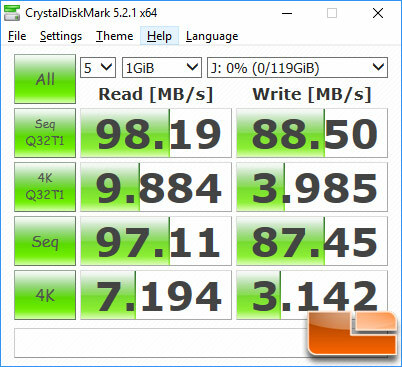 Samsung uses Testmetrix to get the official speeds of Samsung Memory Cards, but we’ll just be doing a quick look at CrystalDiskMark 5.2.1 to see how the sequential Read/Write speeds look on our particular test system. We managed to reach sequential Read speeds of up to 98.2 MB/s and up to 88.5 MB/s Write, so we are really close to the cards rated 100 MB/s Read and 90 MB/s Write speeds! Very impressive sequential transfer speeds! 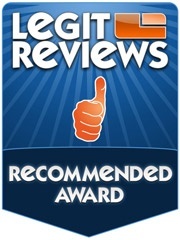 These speeds make it the quickest card that we have tested here at Legit Reviews! ATTO Disk Benchmark also showed that we were close to the rated speeds as we topped out at 97 MB/s Read and 88 MB/s Write when using the latest build on our test system. The Samsung EVO Plus 128GB microSDXC UHS-I memory card is the fastest microSD card that we have tested and that pretty much sums it up. This card was built to be durable with a rating of 10,000 mating cycles and an impressive 10-year warranty. Mating cycles means how many times it can be inserted and ejected, so if you happen to keep this card 10 years that means you can install and remove it 2.74 times per day. If you switch out your cards every few years it means you can install and remove it 9.13 times per day. Samsung also did internal compatibility tests and found that the Samsung EVO Plus series was compatible on more than 1,200 devices (phones, tablets, digital still cameras and digital video cameras) in their testing. 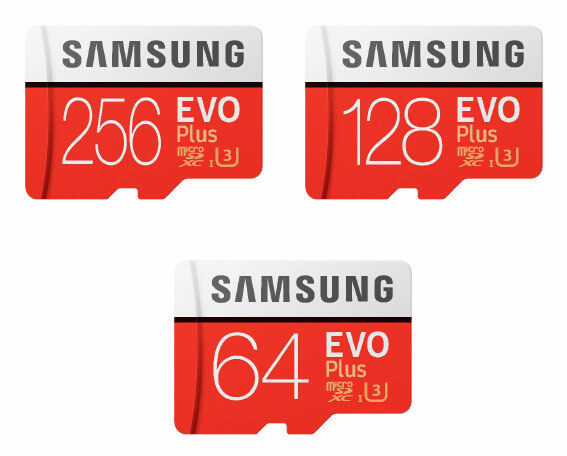 It should also be noted that the Samsung EVO Plus microSD series cards are all waterproof, X-ray proof, magnetic-proof and can withstand operating temperatures ranging from -25C to 85C. Pricing on the Samsung EVO Plus 128GB microSDXC card that we tested today is sold under model number MB-MC128G for $99.99 (MSRP) and that comes out to be $0.78 per GB. The cards should be available on Amazon shortly. Considering that this is the fastest microSD card that we have seen it looks to be a fair price for the consumer that wants a durable and fast memory card! Legit Bottom Line: Samsung’s EVO Plus 128GB microSDXC card performs great and the 10-year warranty along with the high durability rating reassures us that this card should last for longer than we’ll likely be using it! How many of us are using a memory card from 10 years ago today?